Let’s pretend you are new to the fitness scene. Where do you start your journey into exercise – cross-training, aerobics, strength training, or anaerobic fitness? Whether it’s a magic weight loss pill, a 10 day weight loss cleanse, or a 30-day challenge, there’s plenty of noise in the fitness industry around what the ideal workout regimen should be. To add to the confusion, we get territorial over studios, which is a psychological pull to continue doing a particular workout, even if it might not be the best possible option for the body. Since our bodies are a ticking clock, and we lose muscle as we age, the sooner we start building stronger practices to maintain muscle, the better our chances are to live well into our 90’s. Putting our biases aside, let’s explore the differences between aerobic and high intensity (anaerobic) exercise. Dr. Kenneth Cooper was deemed the father of the term “aerobic” in 1960 when he studied the benefits of lung training to uptake more oxygen in activities like jogging, swimming, and cycling. With lung training, he noticed improvements in cell regeneration, mental health, and heart pumping efficiency, which reduced his test participants’ resting heart rates. At the time, Cooper likely didn’t realize he would start a cardio craze that would last for 50+ years. What many cardio obsessors don’t know is, although aerobic exercise trains the lungs in oxygen uptake, training the heart is only a small component of the overall metabolic system. Building muscle is the other half of the metabolic coin, because muscle burns fat and our lungs don’t. Going on a long run can be great to build a foundation for quad & calf muscles, and to clear the mind with an endorphin release; however, running and other cardio work are not the best ways to consistently burn fat. On the other side of aerobic fitness is high intensity exercise, which is rapid and deep level muscle fatigue to stimulate future muscle adaptations (growth) – i.e. activities such as sprinting, strength training, and Lagree Fitness. Biologically, our bodies are programmed to exert an immense amount of energy in a short period of time, because thousands of years ago our ancestors needed to sprint or move a large boulder quickly (think – hunting a wild animal). Our human ancestors were not going on long runs in Africa to improve their oxygen uptake; They sprinted with every muscle in their bodies, in order to survive. Each time the body is faced with a high intensity challenge, our muscles go through a process of breakdown, followed by a period of healing, and finally they proceed to rebuild stronger than they were before, in order to perform better when faced with a similar challenge in the future. This is adaptation. If we want to maintain muscle, the body must always be challenged to continue the adaptation cycle. So, how often should we be hitting the studio to keep our longterm health goals on track? 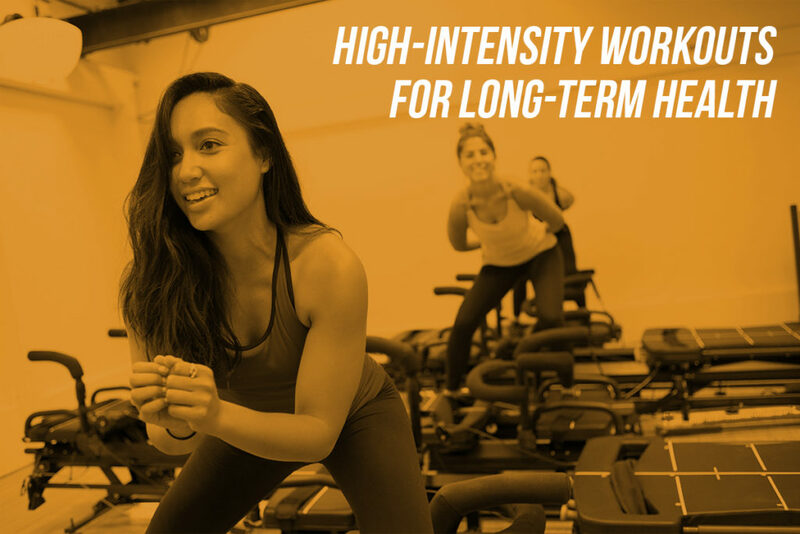 If we stick to the science of anaerobic workouts, which stimulate aerobic benefits, we can work out 3-4 times per week and get the same cardiovascular benefits of strictly aerobic workouts. Spending less time on the track putting unnecessary impact on our joints means more time building muscle to live longer, healthier, and happier lives. Of course, the challenge-level and workout regimen are both up to you. Start your transformation and register for the First Class for $20, here.